Exit I-88 at Annie Glidden Exit 105 ($.55 toll) north. Continue traveling north through Taylor Street (stop sign), Lincoln Hwy – Rt. 38 (stoplight), Lucinda Avenue (stoplight), Hillcrest Drive (stoplight) to Dresser Road. Proceed north through the intersection of Dresser Road and Annie Glidden to the Health Facility entrance (approximately 0.2 miles). Turn RIGHT (east) into the Complex. *The Multipurpose Room is to the right. The entrance is in the middle of the cul-de-sac. Take Route 64 West to Sycamore to Route 23 (stoplight). Proceed through Sycamore to Glidden Road (a total of 5 miles). Turn LEFT (south) on Glidden Road. Continue south on Glidden past the intersection of Rich Road and Glidden. Proceed approximately 1.2 miles to the Health Facility entrance after that intersection. Watch for the DeKalb Water Tower. Turn LEFT (east) into the Complex. Exit I-90 at Highway 47- Turn LEFT (south) on Highway 47 to Highway 64Turn RIGHT (west) on Highway 64 thru Sycamore to Glidden Road (a total of 16 miles). Turn LEFT (south) onto Glidden Road. Watch for the DeKalb Water Tower. Continue south on Glidden through the intersection of Rich Road and Glidden to the Health Facility entrance (approximately 1.2 miles). Turn LEFT (east) into the Complex. Exit Highway 20 at I-39 South Exit I-39 at Highway 64 – turn LEFT (east) Travel on Highway 64 (about 10 miles) to Glidden Road. Turn RIGHT (south) onto Glidden Road. Continue south on Glidden past the intersection of Rich Road and Glidden to the Health Facility entrance (approximately 1.2 miles). 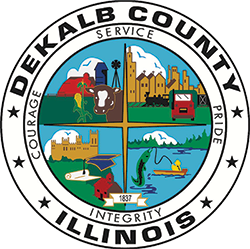 Watch for the DeKalb Water Tower. Turn LEFT (east) into the Complex. Exit I-88 at Annie Glidden Exit 105 ($.55 toll) north. Continue traveling north through Taylor Street (stop sign), Lincoln Hwy – Rt. 38 (stoplight), Lucinda Avenue (stoplight), Hillcrest Drive (stoplight) to Dresser Road. Proceed north past the intersection of Dresser Road and Annie Glidden to the Health Facility entrance (approximately 0.2 miles). Turn RIGHT (east) into the Complex. Exit I-39 at Highway 64 – turn LEFT (east) Travel on Highway 64 (about 10 miles) to Annie Glidden Road (4-way stop sign). Turn RIGHT (south) onto Annie Glidden Road. Continue south on Annie Glidden past the intersection of Rich Road and Annie Glidden to the Health Facility entrance (approximately 1.2 miles). Watch for the DeKalb Water Tower. Turn LEFT (east) into the Complex. Exit I-39 east on I-88. Exit I-88 (before the Oasis) at Annie Glidden Exit 105 ($.55 toll) north. Continue traveling north through Taylor Street (stop sign), Lincoln Hwy – Rt. 38 (stoplight), Lucinda Avenue (stoplight), Hillcrest Drive (stoplight) to Dresser Road. Proceed north through the intersection of Dresser Road and Annie Glidden to the Health Facility entrance (approximately 0.2 miles). Turn RIGHT (east) into the Complex.